Hanoi (VNA) – There would be no big fluctuations in the foreign exchange rate and interest rate in 2019 as pressure caused by the normalization of monetary policy in major economies in the world has eased, according to the Vietnam Institute for Economic and Policy Research (VEPR) under the VNU University of Economic and Business. In a report on the macro economy in the first quarter released on April 11, the VEPR research group noted that the daily reference exchange rate set by the State Bank maintained a rising trend since the beginning of the fourth quarter of 2018 to the end of the first quarter this year. At the end of March, the rate was nearly 1 percent higher than the level one year ago, lower than the 1.4 percent yearly gain in the fourth quarter of 2018. Meanwhile, the VND/USD exchange rates listed at commercial banks stayed close to the ceiling rate in the trading band of 3 percent. On March 31, the rate listed at commercial banks stood at 23,250 VND per USD, up only marginally from the rate of 23,245 VND per USD in the fourth quarter last year. Meanwhile, the inter-bank interest rate in the first quarter this year showed a rising trend, fluctuating between 3.38 percent (in mid-January) to 5.6 percent (at the end of February and immediately before the lunar New Year holidays). The report said the rate reached the quarter’s peak just before the lunar New Year holidays due to surges in demand for short-term credit. The rate then dropped towards the end of the quarter to 3.32 percent. The rise in the inter-bank rates was attributed to the requirement for banks to ensure compulsory reserves and changes in deposits in major banks. 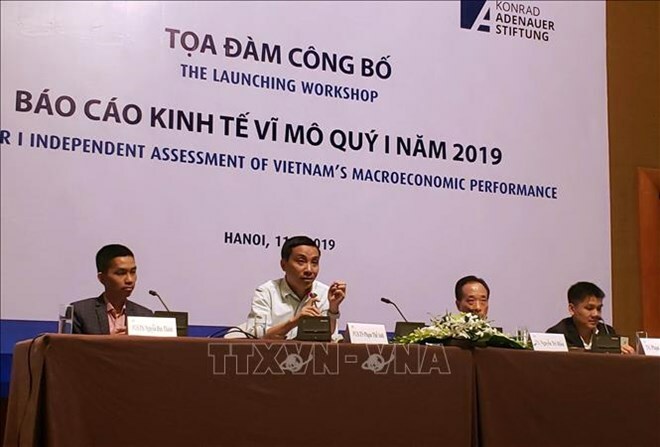 Director of the VEPR Nguyen Duc Thanh recommended that the top priority is to manage the forex rates in a flexible way to cushion impacts from outside changes. Meanwhile, the interest rate should be kept stable to facilitate enterprises’ access to the capital market.